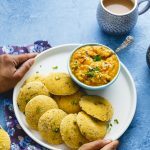 Make these Instant Oats Idli and serve them with Potato Sagu. It is an instant recipe that requires no fermentation, no soaking. Blitz the Rolled Oats in a blender and set the Oats flour aside aside. Heat Ghee in a pan, add mustard seeds, cumin seeds and urd dal. Once mustard begins to splutter, add curry leaves, cashewnuts. Fry them in low flame for 2 minutes. Add grated ginger, semolina and roast in low flame until you can feel the aroma. Add Oats flour and roast in low flame for another 2 minutes. Next add some Grated carrots and coriander leaves and mix again. Transfer the flour mix to a Mixing bowl and set it aside to cool. Add Salt, Greek Yogurt and about 1.25 Cups of water and mix well. A medium spoonable consistency must be achieved. If you think the batter is too thick, add a little more water is needed. Remember the batter should not be very thin. Set the batter aside and allow it to settle for atleast 10 minutes. In the meanwhile, apply ghee/ oil onto the idly plate. After 10 minutes, divide the batter into 2 portions if you have a smaller idly plate like mine. Add 1/2 the fruit salt in one portion and stir well. Spoon the idly batter onto the plates and steam them for approximately 12- 14 minutes. Check by inserting a fork in it. If the Idly's come out clean, we are ready to remove them from the plate. Add the remaining fruit salt to the remaining batter portion and stir well. Repeat the process and make Oats Idly. This recipe portion yields 12 Idly's. Serve them with Bombay style Potato Sagu. Incase you have 12 portion Idly plate, you may mix all the Fruit Salt/ Baking Powder in a go and spoon the idly batter.